We're only a few weeks away from the big day, AKA Valentines Day! If you're like me then this day doesn't really excite you. This will be Kyle and my 5th Valentines together and while it's a sweet day it doesn't hold much tradition in our relationship. I do think its thoughtful to receive flowers or a card but I've never been one for huge displays of affection on a set holiday. Generally, Kyle & I will cook a 'fancier' dinner at home and have dessert, then we will rent a movie or play a game. I suppose this has become our one tradition- not going out! We did go out during our early years of dating and I remember looking around at others in the restaurant thinking wow, I'd rather be in my PJs eating chocolate in bed! Since we don't do anything elaborate for Valentines Day we often get each other concert tickets and that's our 'gift' to each other. This year we purchased tickets to Keith Urban & we are so excited! I love that the gift is something we get to do together, and now we have something to look forward to. If you're looking for some gifts for the day, the few I listed above would be perfect! 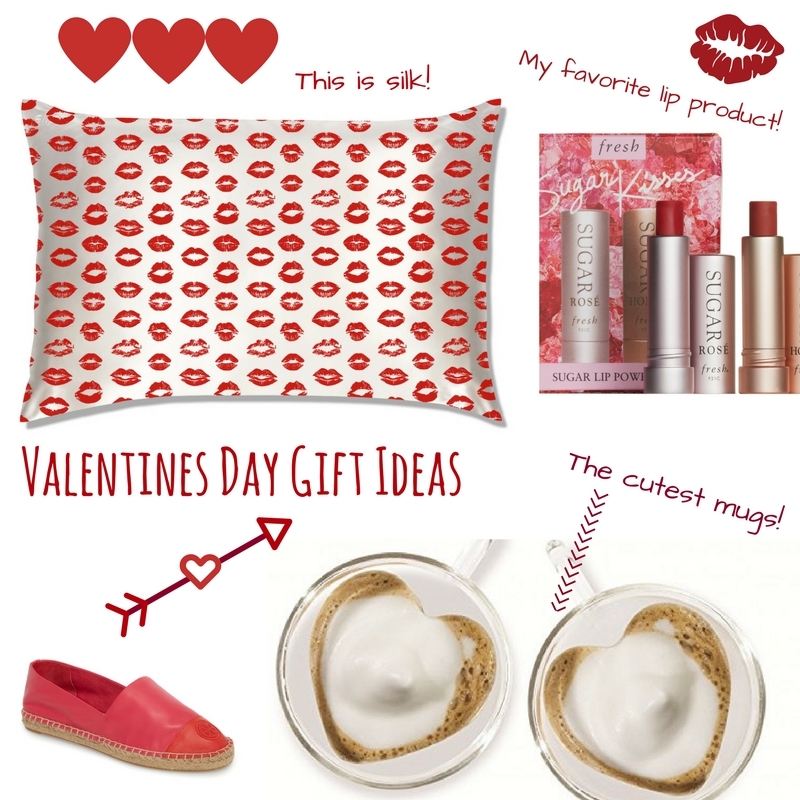 I think my favorite item would be the Heart Cappuccino Cups! If you're wanting to splurge I think the Silk Pillowcase would be great! I've heard so many good things about them & the benefits they have on your skin and hair. Do you have any fun Valentines traditions? I did attend a Galentine's party this year which was new for me! My friend Annaliese hosted it and there were yummy snacks and drinks, very different & fun! I'd love to hear how you celebrate this day! Let me know! ohh such cute finds! I love those red shoes! Such cute ideas! Silk pillowcase is a great idea because it's nice to have but not something you would want to buy yourself. I love the Sugar lip products! So good. These are super cute picks! Love the fresh lip balms! Those are my faaave! Fresh Sugar lip products are my absolute favorites too! I am loving these ideas! So cute!